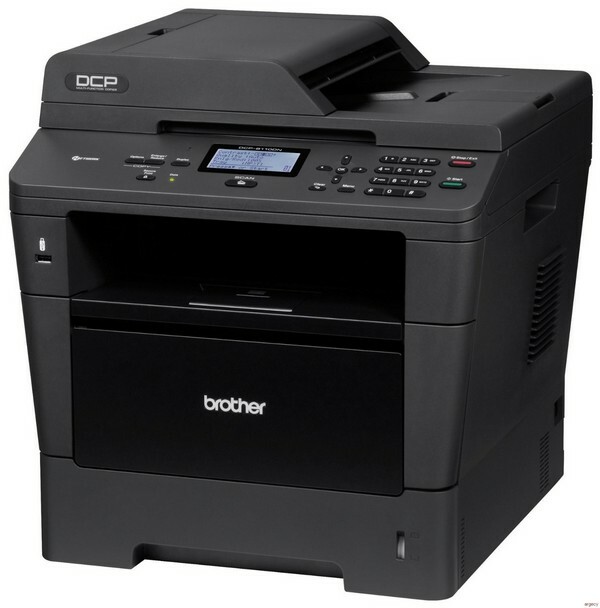 The Brother DCP-8110DN is a cost efficient monochrome laser multi-function copier for your desktop or busy office. It offers fast, reliable copying and printing up to 38ppm and color scanning in one space-saving design. Scan or copy multi-page documents via its 35-page capacity auto document feeder or use the document glass for bound materials. You can share the DCP-8110DN with others on your network via its built-in Ethernet interface or print from your mobile device via: AirPrint, Google Cloud Print, Brother iPrint&Scan, or Cortado Workplace. Plus, it offers automatic duplex (two-sided) printing to help save paper and a convenient USB Direct Interface for walk-up printing and scanning. To help lower your operating costs, a high-yield replacement toner cartridge is available. Fast printing and copying. Quickly produce high-quality black & white output at print and copy speeds up to 38 pages per minute. Automatic two-sided printing. Print professional two-sided documents, brochures, and booklets using the built-in duplex feature. This feature can help you save money and cut your paper usage by up to 50%. Flexible connectivity. Print or scan over your Ethernet network or connect locally via its Hi-Speed USB 2.0 interface. Valuable copier features. Includes time-saving copier features such: Standalone copying, ID copy, Sorting, Reduce/enlarge documents from 25-400%, and N-in-1 copying. Advanced scanning capabilities. Offers high-quality color scanning and supports a variety of "scan to" functions including: E-mail, file, image, OCR, FTP, and Network Folder (CIFS - Windows only). Convenient mobile device printing & scanning. Print from your mobile device via: AirPrint, Google Cloud Print, Brother iPrint&Scan and Cortado Workplace. Plus, wirelessly scan to your mobile device with the Brother iPrint&Scan app. Flexible paper handling. The DCP-8110DN features an adjustable, 250-sheet capacity tray for letter or legal-size paper, plus a 50-sheet capacity multi-purpose tray. 35-page capacity auto document feeder. Use for unattended copying or scanning of multi-page documents (up to legal size). Convenient walk-up printing and scanning. A USB Direct Interface is located on the front of the machine for printing files from or scanning files to your USB flash memory drive. Advanced security features. This monochrome laser multi-function copier provides a wide range of security features including: secure print, Secure Function Lock, Enterprise Security (802.1x) and more. Outstanding customer support. The Brother DCP-8110DN offers a 1 year limited warranty with free phone support for the life of your product. Sheet Weight - Paper Tray 16-28 lbs. Sheet Weight - Multi-purpose Tray 16-43 lbs. Unit Dimensions (W"xD"xH") 15.9" x 16.3" x 16.7"
Carton Dimensions (W"xD"xH") 21.0" x 20.3" x 23.7"
< Unit Weight (lbs) 34.4 lbs. Carton Weight (lbs) 43.4 lbs. 1For WIA, 1200x1200 resolution. Brother Scanner Utility enables to enhance up to 19200 x 19200 dpi. 2Third party USB ports are not supported. 3Nuance PaperPort 12SE supports Microsoft SP3 or higher for Windows XP and SP2 or higher for Vista, Windows 7 and Windows 8. "Scan To" Feature Scan to Network Folder (CIFS) not available for Mac OS. Carton Contents Approximate toner cartridge yield in accordance with ISO/IEC 19752 (letter/A4). Drum yield is approx., and may vary by type of use. For more information see www.brother.com/pageyield. Mobile Device Scanning App Requires connection to a wireless network. Multi-purpose Tray Max. capacity based on using 20 lb. paper. Standard Interface(s) Cable(s) not included.